We have three spaces for hire - the East Hall, the West Hall and the Hengrave Room, plus the main kitchen and lockable storage. You don't need to hire the main kitchen to make drinks, as there is a teapoint in each hire space. 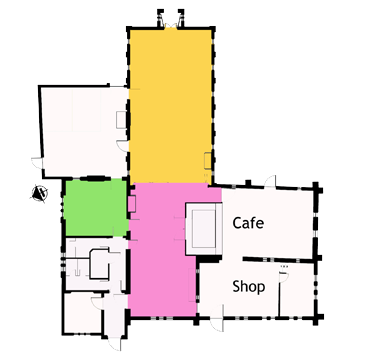 The East Hall is yellow, the West Hall is pink and the Hengrave Room is green. We are fully wheelchair accessible and have baby changing facilities. 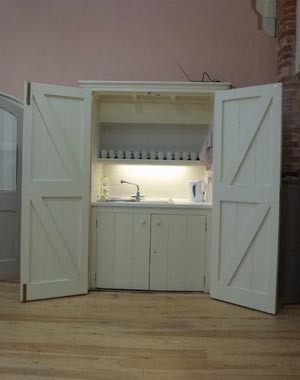 Each hire space has a (free of charge) tea point as in the little photo here to make your own drinks. These have equipment for making both hot and cold drinks and have a sink with hot and cold running water. They are equipped with two kettles, mugs, glasses, and fairtrade tea/coffee/sugar, as well a couple of 'herb' teas and washing up stuff. You can bring your own supplies if you'd like to. You could borrow our urn for larger numbers – please let us know at the time of booking. You'd just need to bring milk (we don’t have refrigeration). Our fairtrade café next door is open Tues to Sat 10am till 4pm sharp for light lunches (sarnies, oven baked jacket spuds, homemade soup, quiche and other specials), and yummy homemade cakes and drinks at very reasonable prices. To book lunch for your group, please call Hayley on 01284 756860 to order in advance. They have a £5 and a £7 a head menu. You are also welcome to bring in your own supplies, or organise your own catering. The cafe is staffed mainly by volunteers and we'd love you to join us in supporting fair trade and make new friends at the same time. Call Hayley to chat about this, or pop in to see her. We also have the following available to use/hire. .. Please make arrangements at the time of booking. Internet access We have fast Wifi throughout. The service does have some restrictions in terms of permissible downloads. The password is displayed in the halls. Trestle tables and chairs We have 11 x 6ft tables, 9 x 5ft tables and 4 x 4ft tables and 56 chairs. We are happy to hire the tables and chairs for external community events in exchange for a modest donation to The Centre. Hearing loop & microphones available in East and West Halls but not in Hengrave Room. Hi Fi speakers for projector/ laptop/iphone/ipad connection. Lockable storage - subject to availability. There are separate Terms and Conditions for storage hire. Table /chair set up & clear away needs to be booked in advance, we may not be able to provide this on spec as we staff The Centre part time. Lockable Storage – subject to availability. Details on ‘Storage’ page.